FILE - Soldiers in tanks are paraded across Kim Il Sung Square during a military parade, April 15, 2017, in Pyongyang, North Korea. The United Nations is investigating at least seven African countries accused of receiving military assistance from North Korea. As the U.N. investigates at least seven African countries for possible violations of United Nations sanctions on North Korea, many other countries across the continent have, in recent years, deepened their economic ties to the reclusive Asian regime. From 2000 to 2015, exports from North Korea to Burkina Faso, Mozambique and Zambia increased by an average annual growth rate of 1.58 percent. Imports from Benin, Senegal and Mozambique saw an average annual growth rate of 1.84 percent during the same period. Across Africa, goods traded with North Korea span an array of sectors and amount to more than $100 million annually. 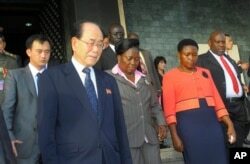 FILE - North Korea’s ceremonial leader, Kim Yong Nam, foreground,left, the head of North Korea’s parliament, is escorted into Uganda's parliament by its Speaker Rebecca Kadaga, center, Commissioner Rosemary Seninde, center-right, and Uganda's Foreign Affairs Minister Asuman Kiyingi, right, in Kampala, Uganda, Oct. 30,2014. The U.N. sanctions, which were first imposed in 2006, focus on arms embargoes and trade restrictions amid ongoing concerns about the development of North Korea’s nuclear weapons program. The countries under review are accused of receiving military assistance from North Korea. According to the U.N., Pyongyang has conducted military training in Angola, Uganda and the Democratic Republic of the Congo; attempted to ship military communications equipment to Eritrea; shipped arms to Mozambique; repaired military equipment in Tanzania; and built military-related facilities in Namibia. Countries accused of violating the sanctions have denied wrongdoing or dismissed the U.N.’s legitimacy. A government spokesperson for Mozambique said the country has not violated U.N. sanctions against North Korea, but it will cooperate with the team investigating alleged wrongdoing. Richard Karemire, a spokesperson for the Ugandan army, said his country is fully aware of the 2016 U.N. resolution and has terminated military training engagements with North Korea. In a written response, Eritrea’s foreign ministry questioned the U.N. panel’s mandate and authority, without addressing whether they have ties to Pyongyang. FILE - Burkina Faso's Foreign Minister Alpha Barry speaks during an AFP interview, July 12, 2016. Burkina Faso’s foreign minister, Alpha Barry, expressed shock and dismay at the possibility his nation collaborated with North Korea. “We have no trace of any trade with North Korea,” Barry said. Any trade that has occurred likely involved intermediaries in Switzerland, according to Barry. Other countries maintain that their relationships were strictly with private entities in North Korea, not the government. “We had a business relationship with North Korean companies and not the government,” said Augustine Mahiga, Tanzania’s foreign minister. However, Pyongyang’s economic ties to Africa have been pervasive. Twenty-nine African nations import goods from North Korea, and 19 nations export goods to North Korea, according to 2015 data from the Observatory of Economic Complexity, a project at MIT’s Media Lab. The deals are small from the perspective of the African nations, accounting for a very small percentage of their total imports and exports. For the top African importer, Burkina Faso, trade with North Korea accounts for $32.8 million, or 1 percent, of annual imports. For the top African exporter, Senegal, North Korean trade accounts for $7.82 million, or 0.29 percent, of annual exports. Compared to China’s trade deals with North Korea, which exceeded $5 billion in 2015, the entire African continent imports just $100 million and exports just $17.5 million of goods from North Korea. But, the tens of millions of dollars a year make a difference across the continent in a range of sectors. From Senegal and Guinea, North Korea imports frozen and fresh fish; from Benin, North Korea imports raw cotton and scrap iron; from South Africa, they import refined petroleum and various other goods. And, from Burkina Faso, North Korea imports vegetable products. Exported goods from North Korea are similarly diverse. North Korea exports refined petroleum to Burkina Faso and Benin. To Zambia, Mozambique and Egypt, North Korea exports cars, plastics, rubbers and dozens of other goods. In 2015, the top five African countries imported more than $73 million in goods from North Korea, and exports from the top five African countries to North Korea added up to $15 million. Trade deals with North Korea are not violations in and of themselves, and many countries have at least minimal economic ties to the regime. But, the U.N. continues to investigate at least seven African countries, along with Syria, for possible sanctions violations. The update released earlier this month shows the investigation has changed little since February, when an initial report was published. Unresponsiveness from the continent as a whole has stymied the U.N.’s efforts. In February, 43 African countries had not submitted national implementation reports (NIRs) for sanctions related to Resolution 2270. These NIRs detail how member states are carrying out approved sanctions. The number of countries that had not filed reports had decreased to 40 by September. Resolution 2270 called for U.N. member states to inspect all cargo destined for or originating from North Korea and halt trade of numerous goods, including aviation fuel, coal, iron, iron ore, gold and rare earth minerals. Increased vigilance is necessary, the U.N. says, because Pyongyang continues to find ways to sidestep sanctions, sometimes by duping member states. Bagassi Koura, Anabela Guedes, Athumani Halima Asijo, and Khalid Ali Abubakar contributed to this report.